Whether it’s because you’re traveling, your local gym is packed with people, or you’re just looking for a break from riding a trainer or running on a treadmill, a rowing ergometer can be a great option for a cyclist, triathlete, or runner. The rowing movement activates over 90% of the body’s musculature and promotes the strengthening of the smaller stabilizing muscles throughout the abdomen, back, and hips. Strength and stability in these areas helps athletes maintain proper cycling, running, and swimming form, which can be a factor in maintaining higher paces and power outputs for longer periods of time. For endurance athletes however, the cardiovascular component of rowing may be more important and beneficial than the opportunity for muscular development. While many people look at rowing as a power sport, the muscle fiber typing in trained oarsmen resembles those of a distance runner, and elite collegiate rowers can attain VO2 max values between 75-85 ml/(kg/min). If you’re also looking to drop a few pounds, rowing delivers great bang for your buck in terms of energy expenditure. 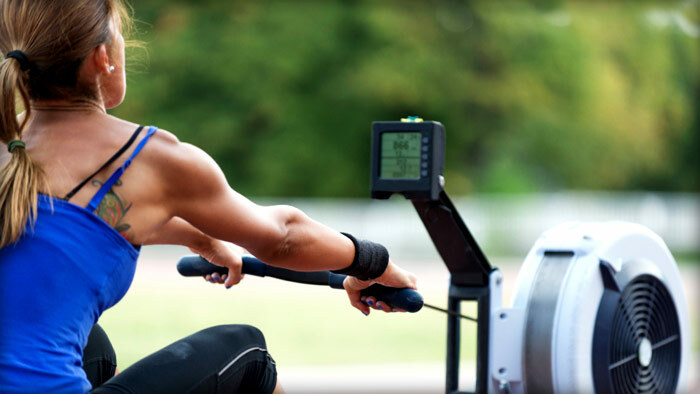 Since rowing involves muscles throughout the body, caloric expenditure rises quickly. During maximal 6-minute efforts, athletes have recorded caloric expenditures of 36 kcal/min. While this may be achievable in other sports, cyclists should keep in mind that the the full-body nature of rowing means you’re burning more calories at any given effort level compared to cycling. For those athletes who are not familiar with rowing, here’s a primer on the terminology and basic techniques. Catch: defined as the beginning position of the rowing stroke. Position should be comfortable. You should be able to stay in this position for a prolonged period of time. The Drive: defined as the primary work phase of the rowing stroke. Finish: defined as the end of the rowing stroke and is an extension of the drive phase. Controls the rate at which the flywheel within the ergometer slows down. Essentially you will interpret this as the resistance you feel from stroke to stroke. For our purposes the damper should be set low, between 1-3. This decreases the likelihood of injuries occurring to the lower back since you’ll use less force per stroke. This setting also encourages the use of high stroke rates, increasing the cardiovascular demand. Collegiate and national team rowers will train mostly on a damper between 4-6. This setting most closely resembles the resistance they feel while rowing on the water during competition. Anything above 6 is very difficult and promotes more muscular strength over cardiovascular ability. You will see a lot of CrossFit athletes at these damper settings because they specifically train to build muscular strength, and they use ergometers for very short periods of time during competition. The Progressive Pyramid workout is a good starting point because it helps you practice the technique of rowing and get a feel for different intensity levels and stroke rates. Later on, one set of the pyramid can be used as a great warm-up for a more specific workout. Do a total of 10 minutes. This is a great way to focus on technique. These are at a low rate and allow time for you to think about every movement of the rowing stroke, while getting the body progressively warmed up by increasing intensity. Total time of 19 minutes. This may be repeated as necessary to reach desired total time. Once you are comfortable on the ergometer and with the technique, the following workout is a great way to increase strength and cardiovascular efficiency. For simplicity’s sake we will refer to these iterations of the workout as Progressive Pyramid Intervals. Intensity of this workout is between 6-8 RPE (threshold workout). The rowing machine can be a very effective tool in your training. In less than an hour of work you can build your aerobic system and increase strength at the same time. So the next time the treadmills are filled or you’re on the road, look to the rowing machine to keep you on track. Jake Shuppe is an Expert Coach for Carmichael Training Systems, Inc. (CTS). In addition to coaching cyclists, triathletes, and runners, Jake was a 3-time collegiate National Champion in rowing and a member of the relay team that set a Guinness World Record for longest distance rowed in 24 hours on an ergometer. For information on personal coaching, training camps, and Endurance Bucket List events, visit http://trainright.com.